Scooper - Technology News: Which countries have the best work-life balance? In an increasingly connected world where our smartphones keep us in touch with work 24/7, striking the right work-life balance is hard. But some countries are better at it than others. On average, 13% of employees in OECD countries work very long hours totalling more than 50 hours per week, compared to just 2% of workers in Denmark. Pro-family government policies are another reason why Denmark tops the list. These include providing extensive childcare and financial benefits to families with young children. European countries dominate the top 10, with Spain and the Netherlands in second and third place respectively. 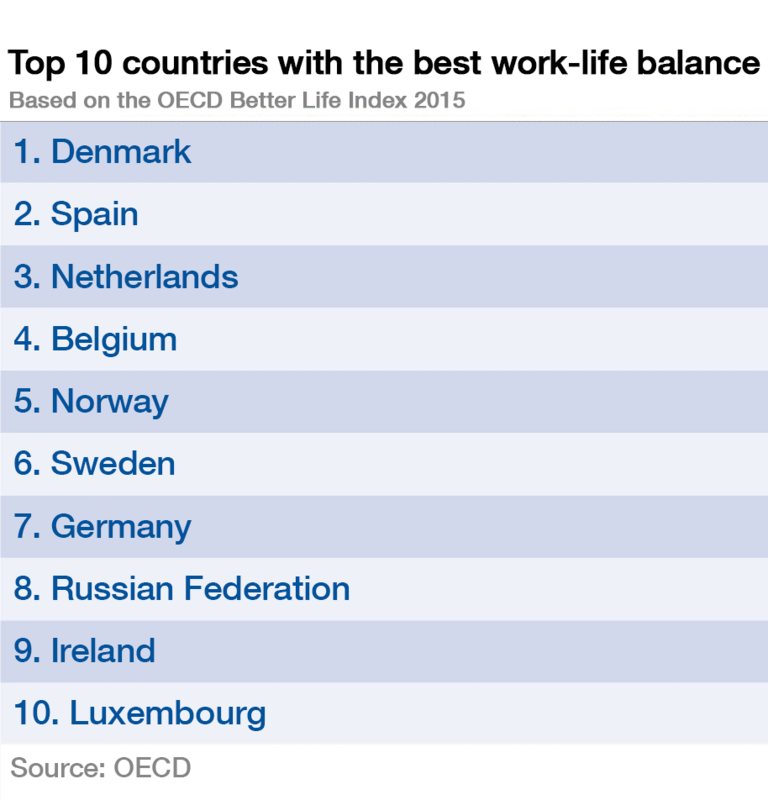 Belgium, Norway and Sweden are also ranked highly for work-life balance. In Spain, the average worker has 16.1 hours of leisure time per day, exceeding the OECD average of 15 hours. Meanwhile, in the Netherlands less than 0.5% of Dutch employees work very long hours, the lowest rate of any OECD country. By contrast, in Turkey, placed last for work-life balance, 41% of employees work very long hours. Mexico, where 29% of employees work over 50 hours per week and have limited access to parental leave, is not far behind. Other low-ranking countries include Chile, Israel, the Republic of Korea and Japan. Although most employees in the Republic of Korea enjoy near OECD average leisure time of 14.6 hours a day, a culture of long working hours and unpaid overtime pushes the country down the rankings. According to the report, long working hours and commuting times in Japan may have contributed to a low fertility rate of 1.41 children per couple, a problem shared by Korea, which has a fertility rate of just 1.30. Is this the end of the 9-5 day? The trend of increasingly long working days is not limited to places like Korea and Japan. According to a survey by Mozy, a global data storage company, the average office worker puts in 12 hours of work a day , both at home and in the office. But while more people are putting in long hours, as this chart from Statista shows, in 2014, work-life balance is still an important priority for people choosing a job. Have you read? 11 experts at Davos on the future of work How is digital media transforming the way we work?